Letting the bees be in charge of their own natural process — This is what makes for natural beekeeping. Honeybees make “brood comb” to raise babies in, “honey comb” to store food in, and all this comb is made from beeswax, and made specifically for the very important things that bees do inside the hive. Sounds simple enough, doesn’t it? Bees make beeswax. That’s the way nature intended it. And bees know how to do it best. — It allows bees to make the cells in the honeycomb in the size that is best for the purpose they will use it for. The size of each honeycomb cell figures into many of the workings of the hive – even down to the length of time it takes a worker honeybee to be born! It’s important because of the chemical contamination that’s been discovered in foundation.The pesticides that have been used by beekeepers in beehives since the mid-1980’s to treat for a parasite infestation — the varroa mite — are “wax-soluble.” This means they are literally absorbed into the bees’ wax honeycombs. Eventually these honeycombs are recycled – melted down, and made into more foundation. Disconcertingly, these pesticides also survive being melted down and made into new foundation. So that even brand new foundation, just purchased, contains detectable levels of these poisons. 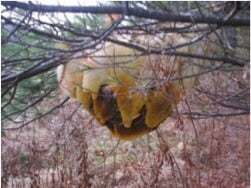 We have made the inside of a beehive a chemical catch-all! We don’t treat our hives with chemicals, and we don’t use foundation wax at all – the bees make all their own beeswax from scratch. But we wondered, does this all really matter? What if the bees bring back toxic chemicals and pesticides from the environment around them — enough to contaminate the wax? These were all good points, so we had the wax tested. Maybe it doesn’t even help to let bees make their own beeswax without the use of foundation. It’s prettier, sure, and it’s less invasive, yes — and it looks like art when you see how they build honeycomb on their own without being forced into the “one size fits all” of pre-printed foundation — but we wanted to know: Does it really make a difference? So now we say -“THE CLEAN WAX CAMPAIGN HAS BEGUN!! !” Keeping bees on their own clean, natural beeswax is one key to having healthy bees. You can be a part of this clean wax movement too. 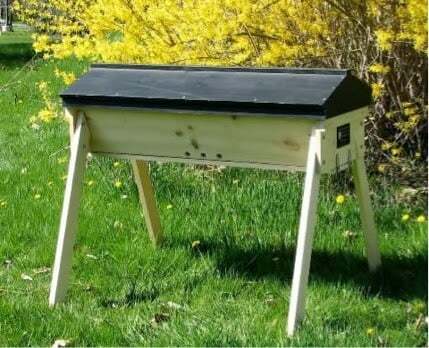 Get in touch with us today and keep your bees in the cleanest, greenest top bar hive available. Christy Hemenway is the owner and founder of Gold Star Honeybees, a complete resource for all things related to beekeeping in top bar hives. A passionate bee-vangelist and advocate for natural, chemical-free beekeeping, Christy is a highly sought-after speaker, helping audiences to understand the integral connection between bees, food, human health and the future of the planet. She is the author of The Thinking Beekeeper: A Guide to Natural Beekeeping in Top Bar Hives. Thrifty Homesteader is a participant in the Amazon Services LLC Associates Program, an affiliate advertising program designed to provide a means for sites to earn advertising fees by advertising and linking to Amazon.com. That means that if you buy something after clicking on a link, we will get a small percentage while you pay exactly the same as you otherwise would. Thank you for your support!